01. From Part 1 and Part 2 in this series it should be clear that the conceptual baggage taken from the Hellenized Jews, Christians and Sabeans by the Mutakallimeen (Ahl al-Kalaam) lead them to a theology characterized and defined through Aristotelian Metaphysics (jawhar, jism, arad, hawaadith). They used this conceptual baggage for their polemics in trying to prove the universe has an originator through the argument of hudooth al-ajsaam. As a result, they erred in the matter of Tawhid by making the issue of proving an originated universe (through pure reason) to be the basis of faith and the greatest foundation of the religion, despite the fact that this is a matter ingrained in the fitrah and was not the primary call of the Messengers. [This is alongside the fact that their alleged proof is flawed in the first place and does not prove or establish an actual "act" of creation took place. The very nature of the argument makes that impossible, otherwise it renders the very creator they are trying to prove to be a body like the rest of the created bodies.] Consequently, their discussion of Tawhid centres only around the ruboobiyyah of Allaah and they are forced to speak about Allaah based largely around the same Aristotelian conceptual baggage and terminology they used to prove his existence. In turn, they also erred in the meaning of ilaah (إله), and uloohiyyah (ألوهية), reducing its meaning to "one with the ability to create, invent" an error linguistically and also legislatively. 02. 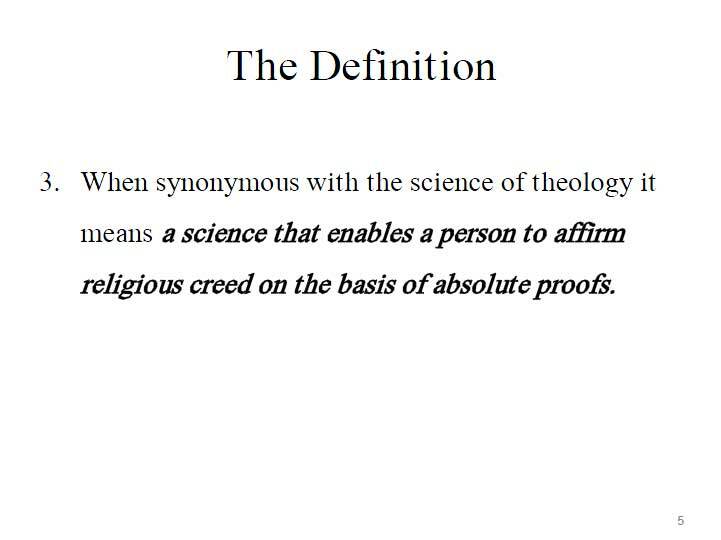 Ibrahim Osi Efa states, "When synonymous with the science of theology..." he is referring here to Tawhid, when this is treated the same a "ilm al-Kalaam" or "usool al-deen" then it refers to "a science that enables a person to affirm religious creed on the basis of absolute proofs." There are three or four issues here (which have been underlined), a) a science b) enabling a person to affirm c) religious creed and d) absolute proofs. We will take up each of these issues. 03. As for the alleged science that Ibrahim Osi Efa is going to peddle for the rest of his course, then it is the science that was condemned by the Imaams of the Salaf from the second century onwards. It is the science founded on the conceptual baggage of Aristotle bin Nichomachus which had been adopted by the Hellenized Jews, Christians and Sabeans (see this series) before it came to the Mutakallimeen in Islaam. It is on the basis of this conceptual baggage that the Jahmiyyah and Mu'tazilah began to deny Allaah's Names, attributes and actions. And the Kalaam groups which came afterwards (Raafidi Mujassimah, the Kullaabiyyah, the Karraamiyyah Mujassimah, the Ash'ariyyah, the Saalimiyyah, the Maturidiyyah) they took the basic foundations of this "science" but they all had different ways and approaches in trying to validate the basic elements of the proof of huduth al-ajsaam (proving the bodies that make up the universe are originated and hence have a creator). It is here where their differences lie as to what degree they are prepared to deny Allaah's Names, attributes and actions in order validate this proof and to what degree they are prepared to distort the Book and the Sunnah in the nameof ta'weel, so that the revealed texts can be reconciled with their flawed corrupt proof. This science is known as "Kalaam" or "ilm al-Kalaam" Anyone who spoke about Allaah's Names, attributes and actions on the basis of this Kalaam was deemed a heretic by the Imaams of the Salaf including the four Imaams and their immediate followers. This is a matter of unanimous agreement and is narrated from the Salaf through tawaatur (large-scale transmission). No one denies this except an ignoramus or person of desires or an arrogant bigot and the historical record can be used to prove him as such. 04. Imām al-Shafiʿī (d. 204H) "The people did not become ignorant and nor differ (with each other) except due to their abandonment of the language of the Arabs and their inclination to the language of Aristotle." Al-Suyuti in Ṣawn al-Manṭiq (1/47-48). ʿAbd Allāh bin Imām Aḥmad narrates from Muḥammad bin Dāwūd who said, "It is not preserved during the era of ash-Shafiʿī that he spoke of any of the desires (innovated matters), nor was it ascribed to him, and nor was he known for it, (this is) alongside his hatred for the people of kalām and bidaʿ (innovations)." Dhamm ul-Kalām wa Ahlihī of Abu Ismāʿīl al-Harawī (4/282). And in famous statement, al-Shafi'i said, "My ruling regarding Ahl ul-Kalām is that they are to be beaten with palm-branches and shoes, carried upon camels and paraded amongst the kinsfolk, it being announced about them, 'This is the recompense of the one who abandoned the Book and the Sunnah and turned to kalām'." Siyar Aʿlām an-Nubulā of al-Dhahabī, (10/29) and Ṣawn al-Manṭiq of al-Suyūtī, (no. 65). Imām Aḥmad bin Ḥanbal (d. 241H) said, "I am not a person of kalām, and nor do I hold [the permissibility] of kalām in anything of this [matter], except what is from the Book of Allāh, or is in a ḥadīth of Allāh's Messenger (sallallaahu alayhi wasallam), as for what is besides that, then indulging in kalām with respect to it is not praiseworthy." al-Aṣbahānī in al-Hujjah Fī Bayān al-Mahajjah (1/130). And Abu Bakr al-Marwazī reports that he heard Abū ʿAbd Allāh [Imām Aḥmad] saying, "Whoever takes to kalām will never prosper and whoever takes to kalām will not escape from tajahhum (adopting the ūsūl of the Jahmiyyah)." Ibn Baṭṭāh in Kitāb al-Ibānah, Kitāb al-Īmān (2/537). With respect to Abū Ḥanīfah (d. 150H), Muhammad bin al-Ḥasan (al-Shaybānī) , the companion of Abū Ḥanīfah said, "Abū Hanīfah said: 'May Allāh curse ʿAmr bin ʿUbayd, for he opened the door to speech (kalām) regarding that which does not concern them of speech.' And Abū Ḥanīfah used to encourage us to gain fiqh (jurisprudence) and would prohibit us from kalām'." and Nuḥ al-Jāmiʿ said: I said to Abū Hanīfah: What do you say about what the people have innovated of speech regarding al-aʿrād and al-ajsām? He said, "(Nothing but) the sayings of the Philosophers. Upon you is (to follow) the narrations and the path of the Salaf, and beware of every newly-invented matter, for it is an innovation." Dhamm ul-Kalām wa Ahlihī of Abu Ismāʿīl al-Harawī (4/213-214) and also Dhamm al-Taʾwīl of Ibn Qudāmah (1/32/33). Abū Yūsuf (d. 182H) the companion of Abū Ḥanīfah, said, "Whoever sought his religion through kalām will fall into heresy." Dhamm ul-Kalām wa Ahlihī of Abu Ismāʿīl al-Harawī (4/210). Note that Abu Yusuf here is speaking of Ibrahim Osi Efa and whoever is unfortunate enough (through al-qadaa wal-qadar) to end up on his course. Imām Mālik (d. 179H) said, "May Allāh curse ʿAmr [bin ʿUbayd], for he innovated these innovations of kalām. If kalām had been knowledge, the Companions and Successors would have spoken regarding it, just as they spoke about the rulings and legislative matters. However it is falsehood that directs to falsehood." Sharh al-Sunnah of al-Baghawī (1/217). And Ibn Surayj al-Shāfiʿī (d. 306H) stated, "The Tawhīd of the people of knowledge and the Jamāʿah of the Muslims is 'I testify none is worthy of worship except Allāh (alone) and that Muhammad is the Messenger of Allāh'. And the Tawhīd of the people of falsehood is disputing about al-aʿrād (incidental attributes) and al-ajsām (bodies) and the Prophet (sallallaahu alayhi wasallam) was sent with the rejection of that." Dhamm ul-Kalām of al-Harawi (4/385-386). 05. All of the above statements are made by the Imaams in the second and third century hijrah, against the Jahmiyyah, Mu'tazilah and Kullaabiyyah, and this is just a small sample of the large body of such statements. The Kalaam of these groups was the Kalaam of al-ajsaam wal-a'raad. The Salaf did not condemn the genus of Kalaam (as in any speech) but something very specific, it was the Kalaam of al-ajsaam wal-a'raad. This Kalaam is the very kalaam that forms the core foundation for the theology of the Ash'aris and Maturidis. It is here that we make note of three academic and intellectual frauds that Ibrahim Osi Efa will convey through his course. The first is their claim that many of the Imaams of the Salaf indulged in "Kalaam" and what they mean by this is that these Imaams simply "spoke on matters of belief" they treat this to be "Kalaam" but this is not the Kalaam condemned by the Salaf, they intended something very specific. They intended the conceptual baggage of al-ajsaam wal-a'raad. This is what they condemned not the genus of Kalaam. Hence, to treat Ibn Abbaas's discussion with the Khawaarij, for example, or any other such type of discussion where truth is affirmed by citing evidence from the Qur'an or Sunnah as being "Kalaam" and treating that the same as the innovated kalam derived from the language of the Metaphysics of a star-worshipping idolator a gross error. This is academic dishonesty. The Kalaam the Salaf condemned is very specific. The second fraud is the pretence of the Ash'aris and Maturidis that they differ with the Mu'tazilah on foundational issues when the reality of the matter is that they agree on foundational issues whilst disputing only on subsidiary issues. They are united upon Kalaam being the basis for theology and all their books start off with the issue of huduth al-ajsaam because the Ash'aris and Maturidis took it from the Mu'tazilah to begin with. They just differ on some of the finer elements of this proof they use to prove the universe is originated and the lawaazim (binding necessities) that follow on from such an argument. However, the very nature of this proof is such that it forces them to deny Allaah's attributes and actions, otherwise the proof would demonstrate that Allaah too is a created body. Their differences lie in what can be affirmed for Allaah without negating the underlying proof used to establish His existence. The Mu'tazilah negate everything, treating attributse to be a'raad (incidental attributes). The As'haris, following the Kullaabiyyah, distinguished between sifaat and a'raad and found a way to distinguish between the attributes of Allaah (sifaat) and the attributes of the created beings (which they labelled as a'raad because as they claim, they undergo continuous re-creation and are never permanent), so the Ash'aris, Maturidis affirm some attributes whilst negating the actions altogether. This partial negation led them to contradiction and inconsistency. The rest of their theology is then centred around inventing new principles and explanations to patch up the contradictions and inconstencies. Hence, the "kalam nafsee" doctrine and "Allaah will be seen but not in a direction" doctrine, and the false principle of al-fi'l huw al-maf'ul and likewise the principle of al-takween of the Maturidis and so on. 06. The third fraud requires a separate treatment because of its crucial importance in having a birds-eye view of how these Jahmites operate out there in the field. This is understood by the following: It is known and accepted by all factions that just because a person ascribes to the Messenger (sallallaahu alayhi wasallam) it does not mean he is a follower of him in all matters, rather, he can be an opposer, a strayer, a disputant in many affairs. We see the Qaraamitah, Baatiniyyah, Mutafalsifah ascribe to the Messenger (sallallaahu alayhi wasallam) when he (sallallaahu alayhi wasallam) is free and innocent of them. And likewise, the various sects, from the Khawarij, Qadariyyah, Murji'ah, Mu'tazilah and others. They also ascribe to the Messenger of Allaah (sallallaahu alayhi wasallam) and atribute to the deen he brought many matters that are not from it at all. So when this is the case, and when this is a matter accepted by all factions and parties, then it is not difficult to also accept that those who ascribe to the four Imaams (Abu Hanifah, Malik, al-Shafi'i and Ahmad), then many of the later ones who affiliated themselves to them (Hanafis, Malikiees, Shafi'is, Hanbalis), they opposed the way of those Imaams and ascribed to those Imaams what they were free and innocent of. Hence, the Maturidis tried to ascribe their kalam theology to Abu Hanifah, and the Ash'aris ascribe to al-Shafi'i what he is free of and some of the later Hanbalis (such as Abu Ya'laa and the al-Timimi family of the fifth century and Ibn Aqeel and Ibn al-Jawzee), they also tried to ascribe things to Imaam Ahmad he was free of, and likewise with the Malikis. The closest and earliest associates and followers of these Imaams were free of Kalaam and its people. But many of the later ones entered into it and were affected by it and some of them tried to ascribe it to the Imaams, and some of them tried to qualify and characterize the creed of those Imaams through this Kalaam language. In reality, not a single Imaam delved into this Kalaam of al-ajsaam and al-a'raad and whoever claims so is a liar and fabricator against them. This brings us to our point which is that from the academic fraud of these contemporary Jahmites is that when they wish to justify their heretical kalam theology, they will draw upon some of the writings and statements of those later ones who came and were affected by something of this Kalaam or its associated language or its binding approach of ta'weel or tafweed. Hence, the appeal to al-Bayhaqi (he was affected by Ibn Fawrak and Abu Mansur al-Bagdhadi though his attachment to al-Ash'aris book al-Ibaanah saved him from from denying the sifaat khabariyyah), and also the appeal to Abu Ya'laa (who was affected by the Ash'arites, having studied with some of them), and likewise to Ibn Aqeel (affected by the Mu'tazilah) and Ibn al-Jawzee (outcast by the rest of the Hanbalis of his time due to his deviation in the Sifaat), and then later scholars such as al-Qurtubi and Ibn Hajar, who though they never delved fundamentally into the core of ilm al-Kalaam, they were affected by its conclusions and associated language and fell into something of ta'weel or tafweed that was necessitated by it. The reader will find the following articles useful for further elaboration on this matter, "The Levels and Ranks of Ash'arism or Those To Whom It is Ascribed" (see here) and the appropriate section in "Destroying the Slander of tajsim (Anthropomorphism) Against Ahl al-Sunnah wal-Jamaa'ah: Part 1" (see here) that makes mention of Abu Ya'laa, al-Bayhaqi, al-Nawawi, al-Qurtubi and Ibn Hajar. 07. Undeniable proof that the Kalaam of the Mu'tazilah is the Kalaam of the Ash'aris can be seen in this article (Aristotelians Anonymous: Admitting Your Creed Is Built Around Aristotle's Maqoolaat Is the First Step to Recovery) which documents only a fraction of the evidence. The Ashʿarites inherited this proof from the Muʿtazilah and it was used as the foundation for the madhhab starting with al-Ashʿarī (d. 324H) in al-Lumaʿ Fi al-Radd ʿalā Ahl al-Zaygh, then al-Bāqillānī (d. 403H), in al-Tamhīd al-Awā'il, then ʿAbd al-Qahir al-Baghdādī (d. 429H) in Kitāb Uṣūl al-Dīn, then al-Isfarāyīnī (d. 471H) in al-Tabṣīr Fil-Dīn, then al-Juwaynī (d. 478H) in Kitāb al-Irshād and also al-Shāmil Fī Uṣūl al-Din, then al-Ghazālī (d. 505H) in al-Iqtisād Fī al-Iʿtiqād, and also Tahāfut al-Falāsifah, then al-Shahrastānī (d. 548H) in Nihāyah al-Aqdām, then al-Rāzī (d. 606H) in Muḥaṣṣal Afkār al-Mutaqaddimīn wal-Muta'akhkhirīn and also Kitāb al-Arbaʿīn Fī Uṣūl al-Dīn, then al-Ījī (d. 756H) in al-Mawāqif Fī ʿIlm al-Kalām. This is undeniable proof also that the condemnation of the Salaf in the second and third centuries against the Jahmiyyah, Mu'tazilah and Kullaabiyyah extends to the Ash'aris and Maturidis, since their theology is an extension of the theology of those earlier groups. Their foundations are undeniably the same. These historical facts are often deliberately concealed by Ash'ari and Maturidi teachers and instructors who misguide the common-folk upon knowledge and on account of bigoted partisanship. So everything which has preceded relates to the "science" that Ibrahim Osi Efa is speaking of, it is a corrupt science taken from the Hellenized Jews, Christians and Sabeans, originating in the language of Aristotle bin Nicomachus (see this series) and that is why you will see their language gravitating towards an Aristotelian deity, expressed through the language of Aristotle, and also why you will be shocked to learn that though the Mutakallimeen fought against the Philosophers on matters such as the origination and eternity of the universe, they actually concurred and agreed about the description of the "first cause" or "deity" they affirmed Just compare between Ibn Sina (see here) and al-Ghazali (see here), for example. 08. As for Ibrahim Osi Efa's statements "that enables a person to affirm..." then the reality of this matter is that when a person takes their arguments through to their full logical conclusions and applies sound reason to them, their science does not actually affirm a created universe, nor a prophet sent and nor a resurrection. This is why they got tangled in centuries of debate with the Philosophers because the Philosophers saw the clear flaws in the proof (of huduth al-ajsaam) they were using through which it is impossible to prove that an actual "act" of creation took place. The very nature of this proof makes this impossible. This then gave the Philosophers a chance to prove that their view (of matter being eternal and necessitated by Allaah's essence, if it exists, matter exists) is true and correct through the argument that the proof of the Mutakallimeen is flawed. But this is a false argument from the Philosophers, just because the Mutakallimeen are using a flawed corrupt proof, does not mean that the view of the Philosophers is correct. It is here that many of the leading figureheads of the Ash'aris got utterly confused, often passing through numerous (contradictory) stages in their lives, and finally expressing utter bewilderment when they reached the end of their lives as is related from al-Ghazali and al-Razi. In the 8th century hijrah, Shaykh al-Islaam Ibn Taymiyyah came and wrote extensively on these matters, and gave a helping hand to the Mutakallimeen against the Philosophers, whilst also refuting much of the falsehood useed by the Mutakallimeen that got them in trouble in the first place. So the point here is that they Mutakallimeen in their alleged rational arguments have not provided satisfactory evidence for the universe beign originated, nor for establishing the prophethood of Muhammad (sallallaahu alayhi wasallam) and nor for the resurrection. And these three matters are raised further in this course and we will address them at the relevant point. 09. Then Ibrahim Osi Efa says, "... to affirm religious creed..." this is referring to Allaah's existence, His oneness, the Messengership of Muhammad (sallallaahu alayhi wasallam) and the Resurrection. The Ahl al-Kalaam indulged in argumentation in these three areas, deviating from simpler, more profound methods in the Qur'an and resorting to blameworthy Kalaam. To prove Allaah's existence they used the proof of huduth al-ajsaam which does not prove any "act of creation" took place to explain the matter and bodies making up the universe. They spoke about the Prophethood of Muhammad (sallallahu alayhi wasallam) limiting the proof to the issue of miracles without satisfactorily distinguishing the signs and evidences of the Prophets from what is done by magicians and swindlers. They spoke about resurrection based upon the Atomism they took from the Mu'tazilah, and opposed hiss (sensory perception) and aql (reason) and did not actually prove any resurrection. It is for this reason that Shaykh al-Islam Ibn Taymiyyah remarked, "And likewise the Kalaam of those who preceded him (al-Razi), from the Jahmiyyah and their followers from the Ash'arites and others, from the Mu'tazilah, for you will not find in their Kalaam which they innovated, not the affirmation of ruboobiyyah, nor prophethood and nor the resurrection" (al-Nubuwwaat 2/629). These matters will be addressed at the relevant parts in this series inshaa'Allaah. The point here is that the Kalaam of the Mutakallimeen leads to doubt, uncertainty, bewilderment and confusion. 10. Then Ibrahim Osi Efa says, "... on the basis of absolute proofs" and they do not have any "absolute proofs" what they have are flawed, corrupt, long-winded arguments, often based upon incorrect premises, that do not achieve the desired objective. These "absolute proofs" they claim will be analyzed at the appropriate place. 11. In summary, what Ibrahim Osi Efa is drawing you into is what the Salaf unanimously condemned in the 2nd and 3rd centuries hijrah, it is the conceptual baggage of Aristotelian Metaphysics that came through the Hellenized Jews, Christians and Sabeans to the "Kalam Dynasty" in this Ummah, the Jahmiyyah, Mu'tazilah and Rafidee Mujassimah in the 2nd century, and the Kullaabiyyah and Karraamiyyah Mujassimah in the 3rd century and the Ash'ariyyah, Saalimiyyah and Maturidiyyah in the 4th century. It is pseudo-intellectualism and pseudo-rationalism that become apparent when you analyze the corrupt arguments they bring. The absurdity of it all is rounded up when you still see them clinging to a particular outdated notion of Atomism outlined in their books which is falsified by contemporary knowledge - a matter we shall take up at the appropriate place inshaa'Allaah.